This picture was taken last night in Vancouver. 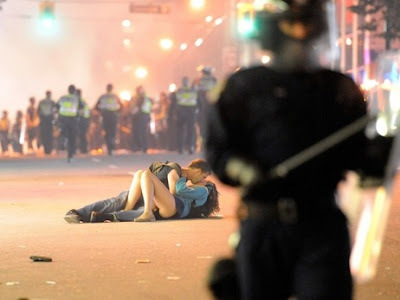 Apparently there was some rioting going on after the Canucks lost the Stanley Cup Finals to the Boston Bruins. But that didn't stop these two lovers from showing their PDA. Oh, Canada. Crazy/beautiful.